WARNING: Julep's Ink Gel Eyeliner - TOSS IT!! 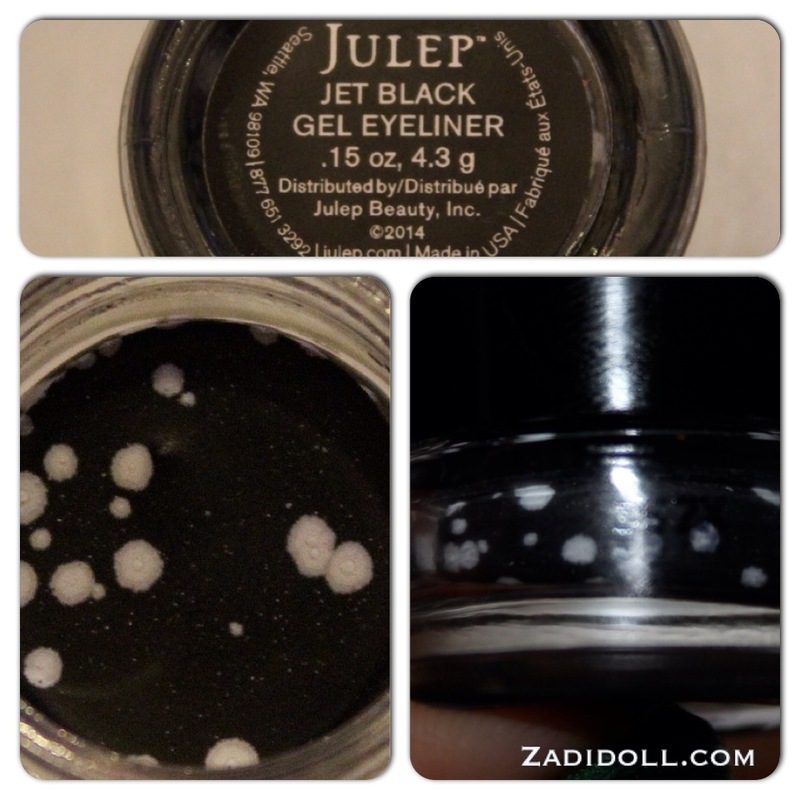 Last year I received the Julep Ink Gel Eyeliner in my February 2014 Dramatic Collection box. This collection also included the now discontinued Eye Sheens. Some of their products I use almost right away, some I don't and some I swatch only. Some products I have several duplicates of so if I have multiples I'll put the other item away for use later down the road. I do this with various products. Since my cross country move I still have a lot of stuff packed and in box inside a plastic tote and put in the back of my closet. I've been pretty slow at unpacking everything but I'm on the last of my unpacked boxes (down to the last two totes) and came across my Julep Ink Gel Eyeliner. Apparently while the product was only released within the last year it was discontinued within months of originally launching but I don't know exactly when it was discontinued. From what the folks on a Julep Swap Facebook group has stated the mold or fungus growth a known issue which is why Julep discontinued the product. 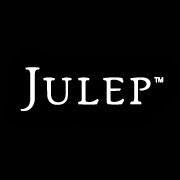 It's news to me since Julep never sent out a recall notice on it. This product does have a six month shelf life label on it however since I never opened it until last night it should have been fine and not filled with mold or fungus or whatever contaminated growth that white, fuzzy thing is. Similar products from other companies can sit months on a shelf in a warehouse waiting to be sent to a retail store where it could spend months before being purchased and you won't see if filled with whatever growth that is in my Ink Gel Eyeliner. This particular product was made possibly at the end of 2013 for shipment to Julep's warehouse by January 2014 and sent to customers in their Maven boxes that February. I know it was still sold in May 2014 as a different blogger posted about it her press samples in a blog post made on May 8, 2014. What I do know is this is among the unused Julep products that I own and considering they have had issues with their 2011 Julep glosses (which were still sent to customers up until September or October 2014), their 2012 mascara (also sent to customers up until September or October 2014) and their Eye Sheens (also a 2014 product that was discontinued by the end of 2014), I do have to question the safety of Julep cosmetics. What else did they discontinue due to potential contamination, mold, fungus and never issued a recall to customers? Bottom line: Customers should have been informed about the reports of fungus or mold growth. One thing is for sure, due to all their past problems with cosmetics I won't be buying anything but polish from Julep. If you received the Ink Gel Eyeliner you might want to check it and toss it even if you don't see anything growing in it. Gross! EDIT: I did contact Julep's customer service department about it and here is their reply. Thank you for reaching out to us. Oh no! We are so sorry to see that your Ink Gel Eye Liner turned out this way. Please do not worry, the white spots you see are not mold. Our Product Development team did come to find that over time, the formula of this product does tend to separate which is what these white spots in the container are showing. Our team is now diligently working on a solution to this problem. In the mean time, we would be more than happy to replace this item with a Gel Eye Glider color of your choice! Below I have provided the link to our website where the Gel Eye Gliders are displayed so that you can take a peek. Let us know what you think and we will place an order for you right away. I did turn the offer down. It appears to me to be mold and some of the spots appear to be fuzzy but not hairy, it's just hard to tell since the jar interior size is around the size of a nickle. I don't know what the whites spots really are but I do it's trash. I do wish that Julep would have contacted customers about the problem because who knows how many other people have these ink liners stored.